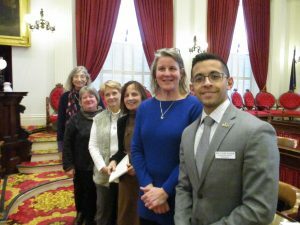 A delegation of staff and Board members from the Winston Prouty Center for Child and Family Development traveled to the Statehouse to hear the official reading of HR 3, a House concurrent resolution congratulating the Winston Prouty Center for Child and Family Development on its 50th anniversary offered by Representatives Mollie Burke, Tristian Toleno, and Emilie Kornheiser of Brattleboro, and Windham County Senators Becca Balint and Jeannette White. 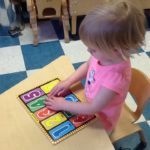 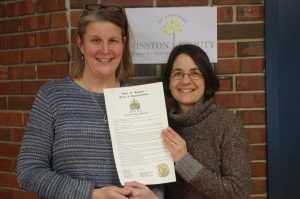 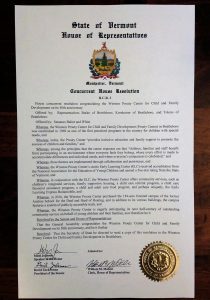 The resolution reviewed The Prouty Center’s History and accomplishments from its founding in 1969 as one of the first preschool programs in the country for children with special needs, to its purchase in 2016 of the campus of the former Austine School for the Deaf to its broad range of programs that support the success of young children, families and early educators. 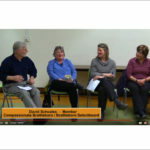 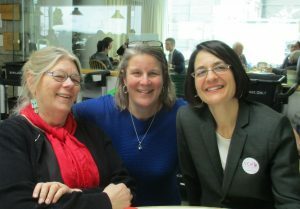 L to R: Susan Heimer, former toddler Lead Teacher; Chloe Learey, Executive Director; Ann Allbee, Board member; and Margaret Atkinson, Director of Development. 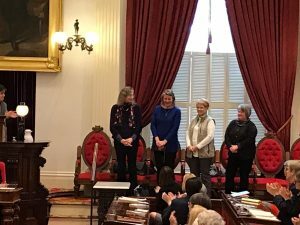 L to R: Susan Heimer, former toddler Lead Teacher; Margaret Atkinson, Director of Development; Board member Ann Allbee; Rep. Mollie Burke; Chloe Learey, Executive Director; and Rep. Nader Hashim. 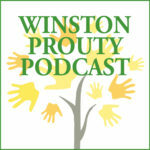 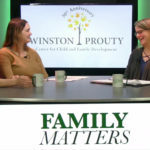 « Who was Winston L. Prouty?